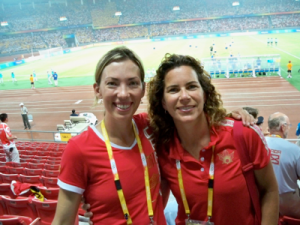 Recently, I remembered a story that Beckie Scott shared at an Olympic Preparation meeting. She was recalling a conversation she had with her mom just after returning from the 1998 Olympics. After a less than optimal series of events, which included a flu bug that practically wiped out her team, she had come home very disappointed; questioning her pursuit of sport. Would success ever come? Was it all a waste of time? As I recall Beckie telling it, her mom suggested to her that she try treating her sport like a career. Initially, Beckie scoffed at the idea – she had always thought of skiing as her passion, a ‘real’ career would come after. Her mom pointed out that she and her dad had invested as much, if not more, into Beckie’s skiing career as her friend’s parents had invested into their university driven ‘normal’ careers!! They saw Beckie’s sport as her career. Beckie realized that her mom was right – it was time to change her thinking and be more proactive and involved in getting what she wanted. If she wanted to do better, instead of waiting for people to show her what to do, she was going to have to be a driving part of that process. “It was a turning point for me,” she said. “Making that mental switch to go professional with my “career in sport”” was the best thing that I could have done with myself at that time”. She and her teammates got more involved in planning and executing their nutrition, training, travel and competition schedules. Being involved in the process worked; Beckie, Sara Renner, Chandra Crawford, Devon Kershaw and Alex Harvey all have medals from the Worlds or the Olympics. There is currently an opportunity in front of you; and there will be many in your life. I’m not suggesting that you suddenly start changing everything around you — that wouldn’t be wise. More so, I’m asking that you take a look at the little details around you. Are you making them happen or are you hoping that they happen to you? Do you create (any of) your environment or do you let others create it and the mood around you? Have you surrounded yourself with supportive people? Are you filling gaps, or waiting for others to fill them for you? A specific example? Okay, here’s a simple one. If you go for a massage and the therapist is working on a knotted muscle, do you wait for the therapist to work it out or, do work with the therapist, relax and concentrate, releasing the knot from your side? It’s your knot, work with the MT to make it go away. No one is going to put you onto the podium; no one is going to give you the results that you are working so hard toward. Others will help to pave your path, but you are the only one responsible for taking it. Remind yourself that you can do it – if you are hands-on and part of the process. This is your career.